There's a Brit currently beating the likes of Childish Gambino and Beyonce in American music charts. Right now, Ella Mai's Boo'd Up is number four on the American Top Songs chart on YouTube and is also sitting comfortably at number seven on the Billboard charts. But Ella Mai, from south London, is not on the UK YouTube charts or the UK Singles Chart. "If you would have told me five years ago this was how my journey was going to go, I would have told someone they're definitely lying," Ella Mai tells Newsbeat. You might remember her from Arize, a group that competed in The X Factor UK back in 2014. Or maybe not considering they were barely on the show. The group had a very successful room audition but were never seen on TV again after they received four rejections at the arena stage. The group split up and Ella Mai did what many people have done to try for a career in music - started to upload covers onto Instagram. The 23-year-old caught the attention of producer DJ Mustard (who has worked with the likes of Cardi B and Big Sean) when her cover of Tupac's Keep Your Head Up ended up on his Instagram Explore feed. The producer DM'd her and asked her what her "situation was" - at this point she was still singing covers in her bedroom. "I had to go on his page and make sure he had the tick to make sure everything was legit," she jokes. Ella Mai's ties with the US go back to her childhood, when she lived there for five years. "I was 12-years-old when I first moved to New York and at that age you're trying to find yourself. "It was hard being so different from everyone I was around and I felt that nobody could really understand me because everyone was American and I was this little English girl with an accent." After being noticed by Mustard, she went back and forth from New York to LA to go to studio sessions and eventually signed to his label. Despite working with someone who is known for making international hits, she is yet to break UK charts. There has been a lot of hype around urban music in recent years in the UK but Ella Mai thinks R&B as a genre is yet to enjoy that same buzz. "I think R&B is way bigger in America. It's not really that mainstream in the UK," she says. "A lot of people say Boo'd Up reminds them of '90s R&B. It has that feeling which is why I think people take to the song so much." But she doesn't think moving to the US is the only way to make it as an R&B artist. "There's a lot of young females doing R&B in England who are extremely talented and deserve more light on their stories. "It's on the up here and I think we'll get there eventually. I'm proud to be from England and doing so well in America so I can fly the flag." Even though it's not been widely celebrated in the UK, Boo'd Up is a big hit over in the US. Released in February 2017 but only really getting big in 2018, the song has got a lot of love from famous faces. It's also being called the "national anthem for men" - which has become a running gag on Twitter because of how affectionate the words are. On Wednesday, the singer released a remix version of the song featuring Nicki Minaj and Quavo. 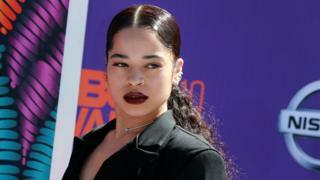 "People have said 'You've got the thugs singing Boo'd up,'" Ella Mai laughs. Ella Mai tells Newsbeat she finds the whole experience "surreal" and that she's "walking proof" that using social media to your advantage can really pay off. She's also been rumoured to be working with Chris Brown after she tweeted a picture of both of them. "I've been working on my debut album for the past year and I can definitely say there'll be some collaborations." Whether she'll finally win over UK audiences with her debut album is uncertain. However, the British singer isn't showing signs of slowing down in the US anytime soon.